In addition to the Green Valley Laughter Club (core laughers needed!) I offer the Laughter Yoga Basics Course, a 1 day seminar that covers (drum roll) the Basics! This allows you to incorporate Laughter Yoga into your life and practice. You can see, especially when you watch other suggested videos, that there's a lot of different ways to practice Laughter Yoga. If you are interested in a Laughter Yoga class that would be mostly aerobic, for fitter folks, I am trying to put one together for 2016. Contact me if you are interested and I'll put your name on the list. I am also working on a class that will more smoothly accomodate people of different fitness levels and will still be a mind/body/spirit practice. Contact me if you are interested and I will put you on the email info list for 2016. Children laugh 400 times a day, while an average adult laughs only 15 times a day. Somewhere along the way adults have lost 385 laughs each day. What are you waiting for? Join us soon and LAUGH! Laughter Club? What the heck is that? Laughter clubs are social clubs where people get together and do Laughter Wellness exercises. Laughter clubs are FREE for all. There is no membership fee and no fuss. They are non-political, non-religious and non-profit organizations run under the auspices of Laughter Yoga International. * No yoga mats required--not even a sense of humor! Laughter Club is open to all adults. You may have heard, “Laughter is the best medicine.” It provides endorphins and immune system support. We use playfulness to create infectious laughter, instead of humor. Green Valley Laughter Club combines standing, moving, and sitting laughter exercises. Talk to your doctor if you have high blood pressure, heart or hernia problems, or other concerns. What happens in a Laughter Session? A Laughter Session is led by a laughter leader who gives instructions for laughter, breathing and stretching exercises. It starts with warm-ups like clapping & chanting ho ho ha ha, followed by different laughter exercises that help people to laugh loud and heartily. We even do Laughter Dancing! The exercises are interspersed with deep breathing. We end with a grounding laughter meditation. No matter if it’s your personal, business or social life, your mood affects everything you do. If your mood is good, everything improves! Laughter helps to change your mood within minutes by releasing certain chemicals from your brain cells called endorphins. You will remain cheerful and in a good mood throughout the day. Laughter is like an aerobic exercise (cardio workout) that brings more oxygen to the body and brain, thereby making one feel more healthy and energetic. 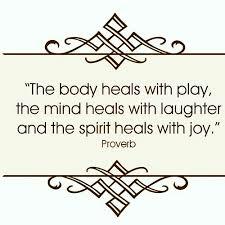 Laughter Yoga™ is a single exercise routine that reduces physical, mental and emotional stress simultaneously. Everyone can laugh when life is good, but how does one laugh when faced with challenges? Laughter helps create resilience and a positive mental state to deal with negative situations and negative people. It gives hope and optimism to cope with difficult times. Quality of life depends upon the quality of good friendships we have. Laughter is a positive energy that helps people to connect with other people quickly and improves relationships. You can’t enjoy life if you are sick. Laughter Yoga™ strengthens the immune system and also helps with a variety of conditions like hypertension, heart disease, diabetes, depression, arthritis, allergies, asthma, bronchitis, backache, fibromyalgia, migraine headaches, menstrual disorders, cancer and many others.